← Female fertility: Whats testosterone got to do with it? Widely promoted as a cure for everything from ear infections to shingles to AIDS, colloidal silver is a solution of silver particles suspended in liquid. 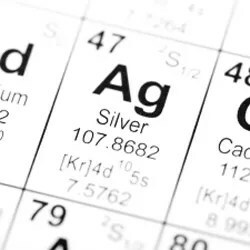 Promoters claim that colloidal silver is an alternative to antibiotics and can extend life and remedy mineral deficiencies that lead to a weakened immune system. Is any of this true? Silver can accumulate in the body and lead to a skin condition called argyria, which causes bluish-gray skin pigmentation, especially around the nose and mouth, a color change that cannot be reversed. Long-term use of oral silver products has led to neurological problems including seizures, as well as kidney damage, stomach distress, headaches, fatigue and skin irritation. It can also interfere with the absorption of some drugs including tetracycline antibiotics and thyroid hormone supplements. While it is true that silver is an effective germicide, it has limited usefulness in medicine. In 1999, the FDA banned the sale of all over-the-counter drugs containing colloidal silver and silver salts as these compounds haven’t been recognized as safe. However the ban doesn’t apply to dietary supplements containing colloidal silver because the FDA has no jurisdiction over such products, unless there are established safety issues. I would avoid all products containing colloidal silver. Posted on October 1, 2014, in Uncategorized. Bookmark the permalink. Leave a comment.